In a large colander, place the pumpkin purée in a double-layered cheese cloth. Wrap the purée in the cloth. Make a knot at the tip and suspend it over the colander using chopsticks. The colander is not essential but is quite convenient; if the knot breaks, you can gather the pumpkin again in the cheese cloth without starting over. Place a larger bowl underneath the colander to collect as much liquid as possible. Let it sit for at least 30 minutes. Discard the liquid. Line up 6 (2.75-ounce) mini-ramekins. In a small saucepan, gently dissolve ⅓ cup sugar with 1 tablespoon water. Bring to a full boil, then lower to medium-low until the caramel becomes golden brown (about 5 minutes). 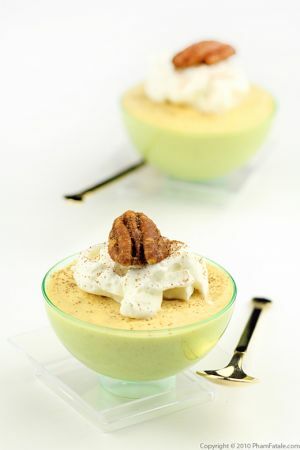 As soon as the caramel is the right golden brown color, pour a layer of caramel into each ramekin. In a small saucepan, combine the heavy cream and milk. Bring to a near boil. Remove from the heat and let the liquid cool for 2-3 minutes. 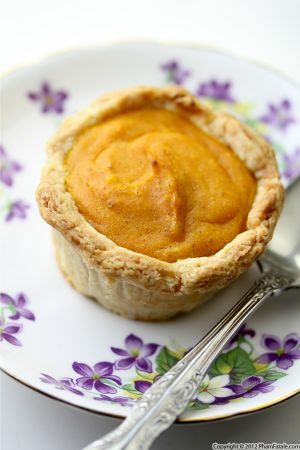 Separately, whisk the egg yolk and whole eggs with the rest of the sugar in a mixing bowl until it becomes pale yellow. Add the extracts. Slowly add the dairy liquid to the egg mixture a ladle at a time to prevent the yolks from curdling. Add the pumpkin pulp. Strain through a fine mesh. Discard the solids (pumpkin pieces) from the strainer. Fill the 6 ramekins with the mixture. 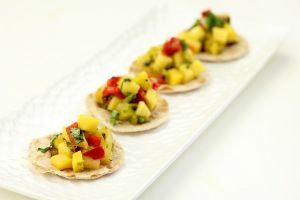 Place them in a warm water (half boiling, half warm) bath in a deep baking pan. The water should go ⅔-way up the side of the ramekins. Bake for 10 minutes at 350°F, then lower the heat to 300°F and bake for an additional 30 minutes. 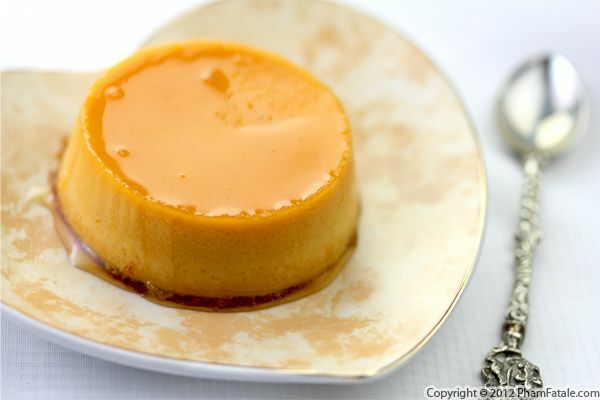 The texture of the crème caramel should be jiggly but not too liquid. Let the desserts cool first, then plastic-wrap each individual ramekin and refrigerate for at least 4 hours. The texture will become firmer. 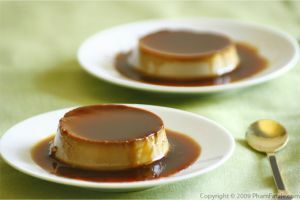 When ready, serve as is or use a paring knife around the crème caramel right before flipping the ramekin, place a dessert plate onto each ramekin and turn both upside down to unmold the crème caramel onto the plate. When making the caramel, make sure all the sugar is dissolved and there is none left on the side of the saucepan. This way no sugar gets burnt and you have an easier clean-up. Prior to placing the saucepan on the stove, I usually slightly dissolve the sugar by creating a swirl in the center of the saucepan with my finger. During the caramelization process, if you see sugar on the side of the saucepan, just brush the side with a wet brush. Believe me, it's so hard to get burnt sugar off a pan! 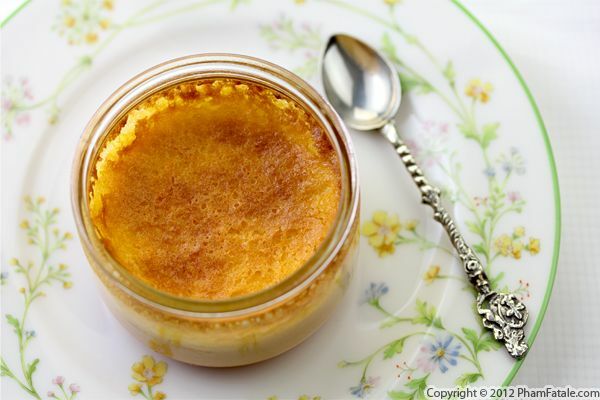 As opposed to crème caramel, crème brulée has a hard caramel topping. 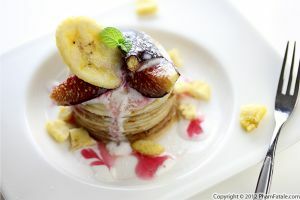 Check out my other French custard desserts. I use liquid McCormick extracts. 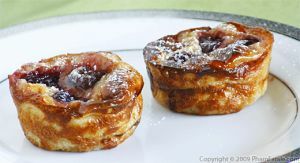 For easy clean up later, fill the ramekins with boiling water, so the caramel gets dissolved. 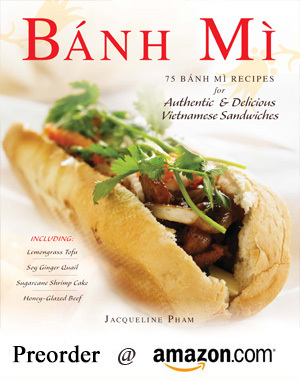 Published By: Jacqueline Pham on November 19, 2012.